You're ready to go into photography full-time, but not sure where to start; or maybe you even already established your business but wonder if you're on the right track. PhotoVision has everything you need and more! These videos show you the latest and most effective techniques that expert photographers currently use to make their work even better, and you can too! See for yourself by checking out the latest video, the premier of a new series by Allison Tyler Jones. 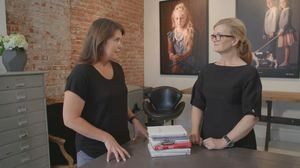 In New Business Owner Advice, Allison discusses how she began in the photography business and shares her best pieces of advice for new business owners. She explains how to start booking clients, building your portfolio, and establishing your price list. She also shares her favorite business books that have helped her throughout her journey as a business owner. PhotoVision is included with your PPA membership. That alone represents savings of $199/year! So, what are you waiting for? Head over to PhotoVisionVideo.com and begin streaming classes today... for FREE! If you're not a member of PPA, consider joining today!